Normal collagen formation is a component of healthy skin. Out skin naturally loses collagen as we age, which results in the common signs of skin aging. 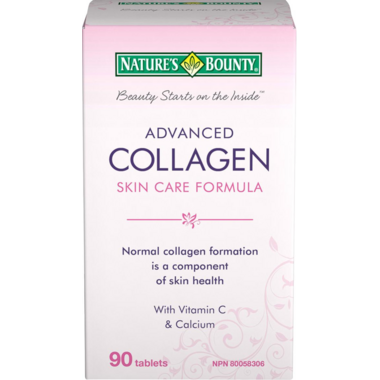 Nature's Bounty Advanced Collagen Skin Care Formula helps to produce and repair connective tissue in the skin and other organs and it contains Vitamin C & Calcium as well. I have been using Advanced Collagen Formula for about 2 weeks now and I do not see any difference on my skin, which I find disappointing; the tablets are also too large and are a bit hard to swallow. The directions on the bottle reads that you have to take 4 tablets a day for a minimum of 5 months to see beneficial effects , which means this bottle will last about 3 weeks. I had purchased 2 bottles and will keep taking them until they are finished and see if there is any improvement. I will not be buying them again. I've been using this product for almost a year now and I've noticed big improvements in the texture of my hair, my skin and nails. Another added bonus seems to be that my hair and nails are growing faster! I have used many collagen products until I found this particular product. I really like it. I would highly recommend it. I have seen good results. This is my second bottle and I would recommend this product. I'm using it for preventative measures to fight signs of aging. So far, so good! I have used the collagen for a couple weeks and my skin seems to be improving so will know for sure soon but will keep taking as all good ingredients!